Background: Peripartum cardiomyopathy (PPCM) is a potentially life-threatening condition marked by left ventricular (LV) dysfunction and heart failure. The disease incidence is rising and most of the cases are identified now due to availability of widespread echocardiography and possible suspicion by cardiologist. Materials and Methods: This was hospital-based study conducted in the department of medicine of a tertiary hospital, Bangladesh. The study population consisted of postpartum patients admitted to medicine ward for evaluating dyspnea from January 2012 to January 2017. Totally 31 patients were diagnosed as PPCM and taken as a sample after exclusion of all criteria. Results: Most of the patients belonged to 20–24 years of age group (51.6%, n = 16) and most patients developed PPCM in primigravida (51.6%). About 67.7% admitted from rural area and 32.3% from urban area. Exertional breathlessness (45.1%, n = 14) and orthopnea (32.2%, n = 10) are the predominant symptoms in all age groups, while exertional breathlessness was 50% presentations from early age group and 14.3% from elder group, while orthopnea was Observed 70% from early age group. Nearly 9.3% of participants in the study had twin pregnancy. Association of gestational hypertension and diabetes mellitus was found in this study group as 12.9%, n = 4, and 16.1%, n = 5. Majority of the patients (35.5%, n = 11) had no specific electrocardiography changes; sinus tachycardia and ST-T changes were found equally (22.5%, n = 7). About one-third of the patients (29%, n = 9) were found to have severe LV systolic dysfunction (ejection fraction [EF] <30%) and more than half of the patients had moderate LV systolic dysfunction (EF: 31%–40%). Conclusion: As PPCM is rising worldwide, so proper suspicion, early referral, early intervention, and prevention can overcome the misdiagnosis of PPCM which often leads to clinical deterioration and in some instances death. Peripartum cardiomyopathy (PPCM) is one of the types of heart failure (HF) that occurs in pregnant women at the time of or following childbirth. PPCM is usually diagnosis of exclusion. According to the Heart Failure Association of the European Society of Cardiology (ESC) Working Group on PPCM 2010, PPCM is an idiopathic cardiomyopathy that presents with HF secondary to left ventricular (LV) systolic dysfunction toward the end of pregnancy or in the months after delivery, in the absence of any other cause of HF. The disease is rare, depending on the geographical location; the reported incidence in the literature ranges from 1:300 up to 1:15,000 (0.1% of pregnancies). 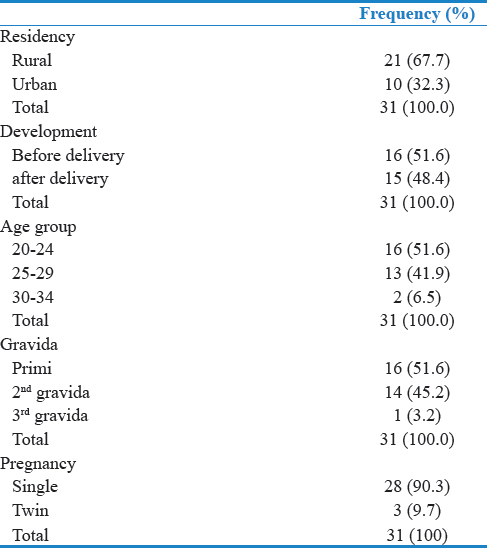 The incidence of PPCM was one case per 1374 live births in an Indian study. Some studies suggest that the incidence of PPCM is one in 3,000 live births. However, one African study found it to be 1:1000 live births. Exact cause is unknown and multifactorial causes such as viral myocarditis, autoimmune response, abnormal hemodynamic response, hormonal abnormality, malnutrition, genetic mutation prolonged tocolysis, and selenium deficiency have been postulated. PPCM diagnosis can be missed because symptoms of HF such as orthopnea, dyspnea, leg edema, palpitations, chest pain, and cough may be present in women during the last months of a normal pregnancy and early puerperium. Since the symptoms of PPCM overlap with those of idiopathic cardiomyopathy, definite diagnosis and subsequent management of PPCM require a high index of suspicion. This is hospital-based study. The study was conducted in the Department of Medicine, Chattagram Maa-O-Shishu Hospital Medical College. The study population comprised postpartum patients referred or transferred to medicine ward from gynecology ward for evaluating dyspnea from January 2012 to January 2017. Totally 31 patients were finally diagnosed as PPCM after exclusion of all criteria. After recovery from acute conditions, data were taken regarding preexisting conditions such as previous heart diseases, preeclampsia, hypertension (HTN) and diabetes mellitus (DM). Electrocardiography (ECG) and echocardiographic results were assessed and noted. Preexisting heart disease and valvular heart disease were excluded from history or after echocardiographic evidences of valvular involvement if patient is unknown. A detailed review of medical history was done to confirm the diagnosis of PPCM if all of the following criteria were satisfied: no previous diagnosis of HF and no other cause of HF could be identified. This definition fulfills the broadly defined criteria by the ESC Working Group. Totally 31 patients were studied, and among them, most of the patients belonged to 20–24 years of age (51.6%, n = 16). Only 2 patients were in elder group and most patients developed ppm in primigravida (51.6%) state. Nearly 67.7% admitted from rural area and 32.3% from urban area. Exertional breathlessness (45.1%, n = 14) and orthopnea (32.2%, n = 10) were the predominant symptoms in all age groups while cough and palpitation were presented as primary symptoms in 7 patients (22.5%). About 50% of participants from early age group and 14.3% from elder group presented with exertional breathlessness while 70% of patients from early age group presented with orthopnea. Most patients were found symptomatic in younger age group (51.6%, n = 24) than elder group (6.4%, n = 2). Gestational HTN was found in 12.9% (n = 4) and gestational DM was found in 16.1% (n = 5). Significant patients were found no specific changes of ECG, rather sinus tachycardia and ST-T changes were the next most common presentations. 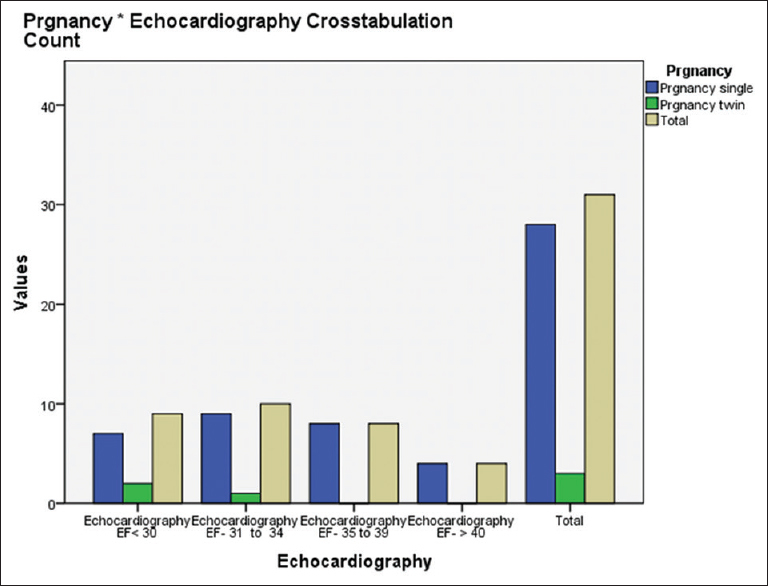 Most of the patients were diagnosed on the basis of suspicions and excluding other conditions by echocardiography. One-third of the patients (29%, n = 9) were found to have severe LV systolic dysfunction (EF <30%) and more than half of the patients had moderate LV systolic dysfunction (EF: 31%–40%). Only one mother's condition was deteriorated due to cardiogenic shock and treated and cured in CCU. No fetal catastrophes were detected in the studied participants [Table 1], [Table 2], [Table 3], [Table 4] and [Figure 1]. The mean age of patients studied was 25.2 years (range: 20–31 years) with most patients being 21–31 years of age. This is consistent with the study done by Sliwa et al., which shows women of 29 years with standard deviation of ± 7 years. Lampert and Lang in 1995 and Whitlin et al. in 1997 found that the disease involved patients of all ages but is more frequent in women >30 years of age. One Indian study showed that most of the affected patients were young with the mean age at presentation being 26.8 ± 4.29 years. Most of the patients were diagnosed in the postpartum period (63.6%). Approximately 60%–70% of women experience a sensation of dyspnea during the course of normal pregnancy. Presenting complaints of exertional breathlessness and orthopnea were found 77.4% in our study. Most patients developed PPCM in primigravida (51.6%, n = 16). Ford et al. in their study found that 72% of their cases were primipara. In the present study, the incidence of gestational HTN in patients with PPCM was 12.9%, which was lower than the 43% reported by Chari et al. but similar to the reported rate of 8%–10% in the overall pregnant population. A recent meta-analysis of 22 studies covering 979 cases of PPCM showed an overall prevalence of preeclampsia of 22%. HTN and DM had not likely associated to developing for PPCM in this study as P value was found as 0.34 and 0.65. Electrocardiographic findings are often normal but can include sinus tachycardia, nonspecific ST-and T-wave abnormalities, and voltage abnormalities. ECG of patients in one study revealed sinus tachycardia in 28 patients (93.3%) and nonspecific ST-T changes in 23 patients (76.6%), and echocardiography findings in our study showed that maximum (32.2%, n = 10) participants presented with severe LV systolic dysfunction (EF: 31%–34%) that was consistent with one study, showing that mean EF was 29.6% with the range of 23–36. The limitation in our study was sample size 31. PPCM is a rare disease, and diagnosis of exclusion. Samples were also taken from the department of medicine referring from gynecology ward for evaluating dyspnea in a local limited bed hospital. Most of the patients suffered from rural area and younger primigravida and mostly present as sinus tachycardia and finally diagnosed by echocardiography. As almost all patients recover with conventional HF treatment, so early diagnosis, continuing treatment, and frequent follow-up can overcome the subsequent relapse of PPCM and related complications. Sliwa K, Hilfiker-Kleiner D, Petrie MC, Mebazaa A, Pieske B, Buchmann E, et al. Current state of knowledge on aetiology, diagnosis, management, and therapy of peripartum cardiomyopathy: A position statement from the heart failure association of the European Society of Cardiology Working Group on peripartum Cardiomyopathy. Eur J Heart Fail 2010;12:767-78. Pearson GD, Veille JC, Rahimtoola S, Hsia J, Oakley CM, Hosenpud JD, et al. Peripartum cardiomyopathy: National heart, lung, and blood institute and office of rare diseases (National institutes of health) workshop recommendations and review. JAMA 2000;283:1183-8. Hibbard JU, Lindheimer M, Lang RM. A modified definition for peripartum cardiomyopathy and prognosis based on echocardiography. Obstet Gynecol 1999;94:311-6. Pandit V, Shetty S, Kumar A, Sagir A. Incidence and outcome of peripartum cardiomyopathy from a tertiary hospital in South India. Trop Doct 2009;39:168-9. Ahmed I, Masroor M, Qamar R, Hashmi K, Sattar A, Imran K. Risk factors associated with peripartum cardiomyopathy. Pak Heart J 2003;36:1-4. Sliwa K, Skudicky D, Bergemann A, Candy G, Puren A, Sareli P, et al. Peripartum cardiomyopathy: Analysis of clinical outcome, left ventricular function, plasma levels of cytokines and fas/APO-1. J Am Coll Cardiol 2000;35:701-5. Whitlin AG, Mabie WC, Sibai BM. Peripartum Cardiomyopathy: An ominious diagnosis. Am J Obstet Gynecol 1997;176:182-8. Woolford RM. Postpartum myocardiosis. Ohio State Mad J 1952;48:924. Joshi AV, Fonseca MN, Kharat-Kapote DS. A study of peripartum cardiomyopathy in a tertiary care center in India. Int J Reprod Contracept Obstet Gynecol 2017;6:523-6. Ford RF, Barton JR, O'brien JM, Hollingsworth PW. Demographics, management, and outcome of peripartum cardiomyopathy in a community hospital. Am J Obstet Gynecol 2000;182:1036-8. Boyle B, McConkey R, Garne E, Loane M, Addor MC, Bakker MK, et al. Trends in the prevalence, risk and pregnancy outcome of multiple births with congenital anomaly: A registry-based study in 14 European countries 1984-2007. BJOG 2013;120:707-16. Bello N, Rendon IS, Arany Z. The relationship between pre-eclampsia and peripartum cardiomyopathy: A systematic review and meta-analysis. J Am Coll Cardiol 2013;62:1715-23. Chari RS, Frangieh AY, Sibai BM. Hypertension during pregnancy: Diagnosis, pathophysiology and management. In: Elkayam U, Gleicher N, editors. Cardiac Problems in Pregnancy. 3rd ed. New York: Wiley-Liss; 1998. p. 257-73. Muti M, Tshimanga M, Notion GT, Bangure D, Chonzi P. Prevalence of pregnancy induced hypertension and pregnancy outcomes among women seeking maternity services in Harare, Zimbabwe. BMC Cardiovasc Disord 2015;15:111. Davidson NM, Parry EH. The etiology of peripartum cardiac failure. Am Heart J 1979;97:535-6.